Two of our library branches, Coldwater and Bronson, have space available that non-profit organizations may reserve. Both locations have a large TV that can accept a computer input and a DVD player. 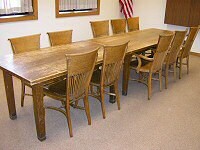 Organizations using this space may show certain films during their use of the meeting space. Ask a librarian for assistance. You may view the room availability schedule for Coldwater Branch. To reserve either of these rooms, please inquire at the branches: Coldwater (517) 278-2341 extension 17; Bronson: (517) 369-3785. Bookings are first come, first serve, and library functions take precedence. Please read our Public Meeting Space Policy and Policy Covering the Public Use of Movie License for more information.